A We Haul It dumpster rental trailer is 12 feet long, 6 feet wide and 4 feet high which is approximately the size of a mini van. It can hold up to 10 cubic yards of material. 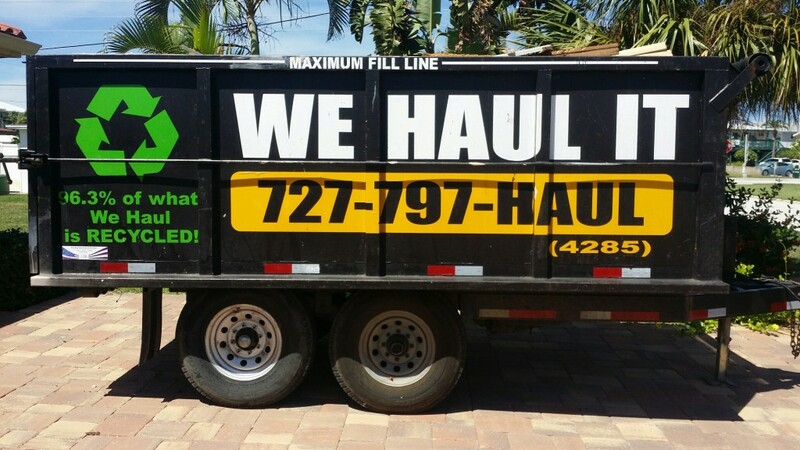 We Haul It has 22 dumpster rental trailers which increase availability, efficiency, and response time when you need our services. Since we work around your schedule, we will drop off our dumpster rental trailer when it is convenient for you. We Haul It can remove almost anything! *Must be loaded in the middle of the trailer over the axles. May not be loaded more than half way up the trailer. If these items are found within the trailer upon dumping, there will be a $100 charge from We Haul for EACH item found. You may also be subject to Federal/State/Local fines and/or charges, as well as being prosecuted by the State of Florida for illegal dumping. *If you have paint/paint cans that need to be disposed of, we recommend that you contact your local solid waste facility. Many of them have “free” homeowner drop off sites. More than likely, this is where your trash goes.